Ludo (/ˈljuːdoʊ/; from Latin ludo, meaning 'I play') is a strategy board game for two to four[a] players, in which the players race their four tokens from start to finish according to the rolls of a single die. Like other cross and circle games, Ludo is derived from the Indian game Pachisi, but simpler. The game and its variations are popular in many countries and under various names. Pachisi was rediscovered in India by the 6th century. The earliest evidence of this game evolution in India is the depiction of boards on the caves of Ellora. Even Pachisi was evolved from a very ancient game of Chausar played in the times of epic Mahabharata (Kurukshetra War time) about 10 century BCE. This game was played between the pandavas and kauravas. Latest version as we describe as Ludo, was played by the Mughal emperors of India; a notable example is Akbar. Pachisi was modified to use a cubic die with dice cup and patented as "Ludo" in England in 1896. [b] The Royal Navy took Ludo and converted it into the board game Uckers. In North America, the game is sold under the brand name Parcheesi. Variations of the game are sold under the brand names Sorry!, Aggravation, and Trouble. In Spain, it is called "Parchís" in Spanish and "Parxís" in Catalan. In Colombia, it is called "Parqués". In Germany, this game is called "Mensch ärgere dich nicht" (Man, don't get upset), and has equivalent names in many other languages, such as Albanian, Bulgarian, Croatian, Czech, Dutch, Macedonian, Romanian, Russian, Serbian, Slovak, Slovene, and Turkish. In Greece, the game is called "Γκρινιάρης" [Griniaris] (Grumbler) referring to typical player behaviour. In Italy, it is called "Non t'arrabbiare" (Don't get upset). In Bulgaria, this game is called "Не се сърди човече" (Don't get angry man). In Poland, it is commonly referred to as "Chińczyk" (The Chinese), though an equivalent form to the German name also exists ("Człowieku, nie irytuj się!"). In Estonia, it is called "Reis ümber maailma" (Trip around the world). In China, Malaysia and Singapore, it is called "飞行棋" or "飞机棋" (Aeroplane Chess). In Sweden, it is known as "Fia", a name derived from the Latin word fiat which means "so be it!" Common variations on the name are "Fia-spel" (Fia the game) and "Fia med knuff" (Fia with push). In Denmark and Norway though, the game is known as Ludo. In Vietnam, it is called "Cờ cá ngựa". In France, it is called "Petits Chevaux" (Little Horses) or "Le Jeu de Dada" (The Game of Dada) (dada being a colloquial word for "horse") and typically played with horse-headed pieces. In Hungary, this game is called "Ki nevet a végén" (Who laughs at the end). 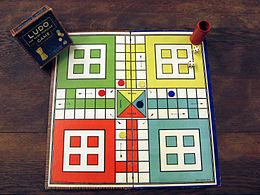 Special areas of the Ludo board are typically coloured bright yellow, green, red, and blue. Each player is assigned a colour and has four tokens[c] in their colour. The board is normally square with a cross-shaped playspace, with each arm of the cross having three columns of squares, usually six per column. The middle columns usually have five squares coloured; these represent a player's home column. A sixth coloured square not on the home column is a player's starting square. At the centre of the board is a large finishing square, often composed of coloured triangles atop the players' home columns (thus depicting "arrows" pointing to the finish). Two, three, or four can play, without partnerships. [d] At the beginning of the game, each player's four tokens are out of play and staged in the player's yard (one of the large corner areas of the board in the player's colour). When able to, the players will enter their tokens one per time on their respective starting squares, and proceed to race them clockwise around the board along the game track (the path of squares not part of any player's home column). When reaching the square below his home column, a player continues by moving tokens up the column to the finishing square. The rolls of a single die control the swiftness of the tokens, and entry to the finishing square requires a precise roll from the player. The first to bring all their tokens to the finish wins the game. The others often continue play to determine second-, third-, and fourth-place finishers. Each player rolls the die; the highest roller begins the game. Players alternate turns in a clockwise direction. To enter a token into play from its yard to its starting square, a player must roll a 6. If the player has no tokens yet in play and rolls other than a 6, the turn passes to the next player. Once a player has one or more tokens in play, he selects a token and moves it forwards along the track the number of squares indicated by the die. Players must always move a token according to the die value rolled. Passes are not allowed; if no move is possible, the turn moves to the next player. When a 6 is rolled, the player may choose to advance a token already in play, or may enter another staged token to its starting square. Rolling a 6 earns the player an additional or "bonus" roll in that turn. If the bonus roll results in a 6 again, the player earns an additional bonus roll. [e] If the third roll is also a 6, the player may not move and the turn immediately passes to the next player. In exceptional cases, such as when two or more tokens are a single digit away from quadrant (securing the win), no extra chance is counted if the players rolls 1. It is widely accepted neither 6 nor 1 should be repeated more than twice. Players may not end their move on a square they already occupy. If the advance of a token ends on a square occupied by an opponent's token, the opponent token is returned to its owner's yard. The returned token can be reentered into play only when the owner rolls a 6. Unlike Pachisi, there are no "safe" squares on the game track which protect a player's tokens from being returned. A player's home column squares are always safe, however, since no opponent may enter them. Ludo played in the Indian continent features a safe square in each quadrant, normally the fourth square from the top in the rightmost column. These squares are usually marked with a star. In India Ludo is often played with two dice, and rolling 1 on a die also allows a token to enter active play. Thus if a player rolls a 1 and a 6, they may get a token out and move it six steps. To get a game started faster, some house rules allow a player with no pieces on the board to bring their first piece into play on any roll, on a 1 or a 6, or allow multiple tries to roll a 6 (with three rolls being the most popular). If a piece lands on the same space as another piece of the same colour, the moved piece must take the preceding space. If a piece lands on the same space as another piece(s) of the same colour, the pieces are doubled or combined and form a block which cannot be passed or taken by any opponent's pieces. Some variations permit such blocks to be passed by rolling a 6 or 1. A block of two or more pieces can be taken by an opponent's single piece. Doubled pieces may move half the number if an even number is thrown (e.g. move two spaces if a 4 is thrown). A doubled piece may capture another doubled piece (like in Coppit). A player must move all the numbers rolled (e.g. if a player rolls multiple 6s, they have to use all the numbers to move). To speed the game up, extra turns or bonus moves can be awarded for capturing a piece or getting a piece home; these may grant passage past a block. In Denmark and some other countries the board has eight spaces marked with a globe and eight with a star. The globes are safe spaces where a piece cannot be captured. The exception is that a player who has not yet entered all pieces, can always enter a piece on a roll of 6. If the entry space is occupied by another player's piece, that piece is captured. Otherwise the entry spaces work like the other globe spaces. A piece which would have landed on a star instead moves to the next star. In Vietnam, it is called "Cờ cá ngựa", where the game is modeled after a horse race with the tokens modeled as horse heads. In this variation, a 1 is given equal status to a 6 (meaning that the player can enter a token into play and can roll again). Furthermore, once a player's token reaches their home column, it can only go up each square with an exact roll. This means that a person outside the column must roll a 1 to enter the first square, a 2 afterwards to enter the second, and so forth. A doubled block also blocks trailing pieces of the player who created the block, or blocks them unless they roll the exact number to land on the block; additionally, the doubled block cannot move forwards until the block that landed upon it moves off again. This reduces the tactical advantage of a block and makes the game more interesting. If the two players sitting opposite are partners, the players can exchange numbers. There are four safety squares on the board, like castle squares in Pachisi, as well as the safe home squares, where a piece may able to move forwards or backwards and start their turn before previous player finishes. A piece landing on a square with an opponent's piece not only sends the opponent piece back to the starting area but also sends the landing piece to its home square. A player cannot move their first piece into the home column unless they have captured at least one piece of any of the opponents. If a player captures the piece of another player, they are awarded a bonus roll. If in the bonus roll, another player's piece is captured, another bonus roll is awarded and so on. ^ In some countries (at least Denmark) a variant for six players is available, but it is uncommon. ^ Tokens were originally flat bone discs; modern materials are cardboard or plastic. ^ "From two to four play, each with four pieces, and without partnerships." ^ "Should a player throw two 6s in succession, he is allowed a third throw." ^ a b Bell, R. C. (1979) [1st Pub. 1960, Oxford University Press, London]. Board and Table Games From Many Civilizations. I (Revised ed.). Dover Publications Inc. p. 12. ISBN 0-671-06030-9. ^ "Pachisi & Ludo – pc games, rules & history". vegard2.net. ^ Padfield, Peter (1995). War Beneath The Sea. New York, NY: John Wiley & Sons, Inc. p. 86. ISBN 0-471-24945-9. ^ a b c d Parlett (1999), p. 49. ^ a b Bell (1983), p. 113. ^ a b c Diagram Group (1975), p. 13. ^ Murray (1978), p. 138. Diagram Group (1975). Ruth Midgley, ed. The Way to Play. Paddington Press Ltd. pp. 12–13. ISBN 0-8467-0060-3. Grunfeld, Frederic V., ed. (1975). Games of the World. Holt, Rinehart and Winston. ISBN 0-03-015261-5. Murray, H. J. R. (1978). A History of Board-Games other than Chess (Reissued ed.). Hacker Art Books Inc. ISBN 0-87817-211-4. Parlett, David (1999). The Oxford History of Board Games. Oxford University Press Inc. ISBN 0-19-212998-8. Wikimedia Commons has media related to Ludo. This page was last edited on 18 April 2019, at 19:00 (UTC).